Lisa is a popular keynote speaker, bringing her practical advice to audiences across the country. She is currently touring with a groundbreaking topic for successful career women: “Smart Women Creating Smart Relationships.” She provides entertaining, practical tips on how to get out of roach motel relationships and into the five-star relationships you’ve always dreamed of. How can you get started on the right path to making sure your relationships sustain and nourish you as much as you need? 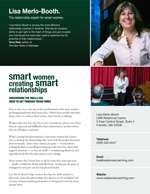 Lisa Merlo-Booth, Relationship Coach and Director of Professional Development for the Relational Life Institute, provides a 2-hour talk and networking session on women and their relationships. Lisa presents for an hour and a half, and then leads a discussion and Q and A session on the topic. Lisa’s talk focuses on women who are sometimes struggling, sometimes succeeding in juggling work life, home demands, relationship challenges, family issues — the list some days can seem long indeed! Women adopt a variety of coping mechanisms to meet the challenges of today’s crazy pace. Do you see a little of yourself in any of these? What about the Detailer, who micro-manages her spouse so that he’s helpless and she’s exhausted? Or, the Cheerleader, who’s relentlessly positive about her relationship 24/7, refusing to acknowledge that any tensions might exist — and meanwhile she’s seething inside? Or the Traveler, who spends all her time with friends, with kids, with her kids’ friends, avoiding the emptiness at home? We all use coping mechanisms like these — with mixed success. Lisa outlines a 5-step process to help women improve their relationships and become as effective in their personal lives as they are in their work lives. Lisa’s goal is to help every woman find a quiet strength that will help her successfully navigate the difficult terrain of modern life and relationships. This is a must event for career women, working mothers and women across the board. It will help transform your romantic relationships, business relationships, family relationships and friendships. Ideal for friends, co-workers or family members. 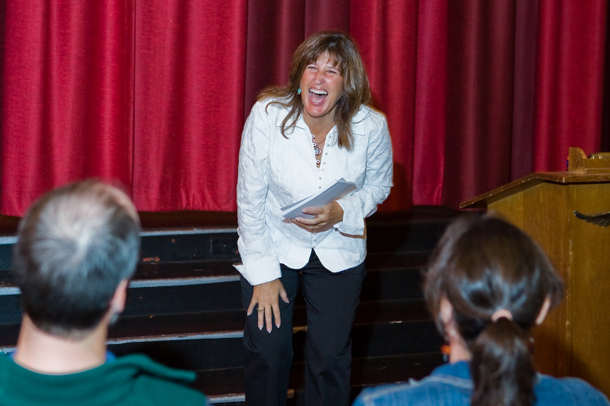 Bring Lisa to your college, university, women’s group, civic group, or not-for-profit organization for an inspiring, funny, transformational presentation that will have you re-thinking all your relationships and finding new ways to get the most out of life and your significant other.